Purchase Building in Fulton Ferry Historic District, Brooklyn, to be demolished to make way for new Brooklyn Bridge Park. 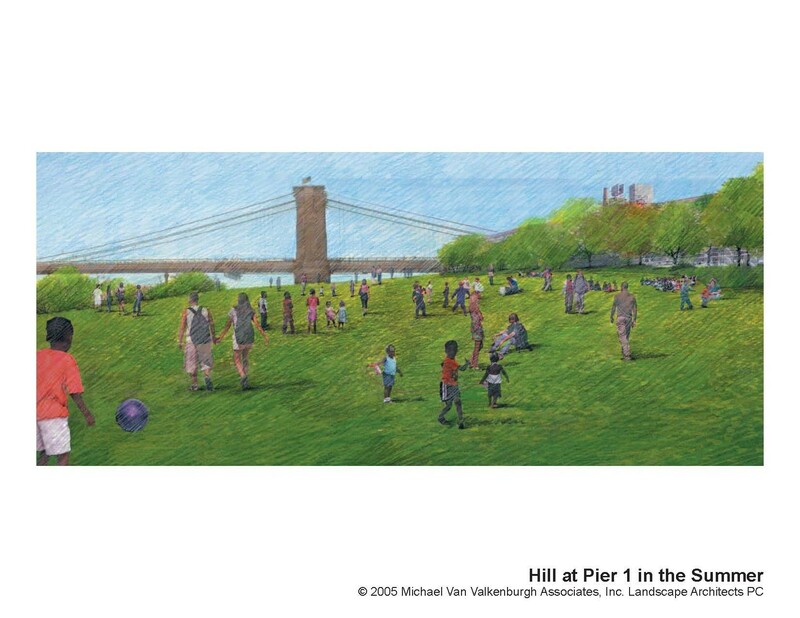 Commission decides that Brooklyn Bridge sightline merits destruction of a building within a historic district. Landmarks held a hearing on February 21, 2006 on an application to demolish the Purchase Building, located at 11-85 Water Street in Brooklyn’s Fulton Ferry Historic District. The applicant, Brooklyn Bridge Development Corporation, was created to manage the development of Brooklyn Bridge Park, a new 85-acre park expanding from DUMBO to Cobble Hill, Brooklyn. The Purchase Building, a 300-foot-long Art Deco warehouse built as a WPA project in 1936, divides the park site and blocks views of the Brooklyn Bridge. At the hearing, a representative from the Brooklyn Bridge Development Corporation testified that Brooklyn Bridge Park would be the most significant park project for the City since construction of Prospect Park in 1860-1868. Parks Commissioner Adrian Benepe urged Landmarks to approve demolition despite the fact that, according to him, Parks “usually appeared before Landmarks to urge preservation and restoration.” A representative from the State Historic Preservation Office also testified in favor of the project, arguing that the warehouse was out of context and non-contributing to the Fulton Ferry Historic District. Other demolition supporters felt it was important to reconnect surrounding neighborhoods to the Brooklyn Bridge and the shoreline, and stressed the area’s current state of industrial underutilization. Lisa Kersavage of the Municipal Arts Society opposed demolition, arguing that the warehouse was architecturally significant and should not be demolished merely because it was in an inconvenient location. Marcia Hillis, president of the DUMBO Neighborhood Association, questioned the precedent that would be set by demolition of the Purchase Building, particularly in light of proposed plans to construct condos and a hotel as part of the Park’s self-sustainability plan. LPC: 11-85 Water Street (LP-020803) (February 21, 2006).